The GNU/Linux, the Free and Open Source Software (FOSS) movements around the globe and Creative Commons had influenced people to share their creations openly and freely. The BiOS is such kind of initiative which is sharing all its biological innovations openly. Now the same concept of sharing the biological materials openly for public good. In Agriculture, the seed is the fundamental input and access to quality seed is becoming restricted to people by financially, technically and legally. To overcome this, the Open Source Seed Initiative (OSSI) was formed and it aims to free the seed. The OSSI had pledged to make the seed free and is permitting the buyers/consumers to use in any ways they want but asks them not to restrict the others use with patents or by any other legal means. 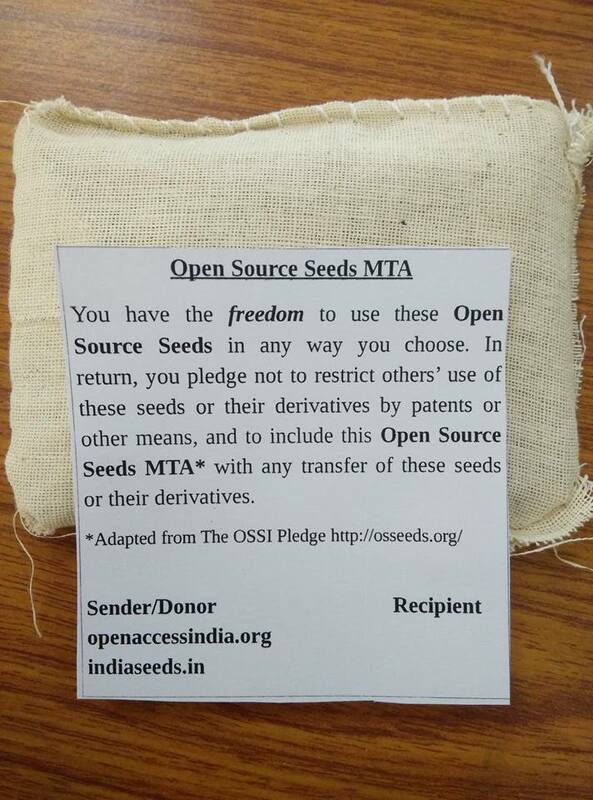 In order to familiarize/popularize the philosophy of Open Source Seed/Free the Seed concept, the Open Access India and IndiaSeeds.in jointly took an attempt to seeds which are almost free of any legal IPR rights. For this as a test crop, Quinoa (Chenopodium quinoa) has been selected and the excess seeds which were purchased from a farmer by name Undavalli Trimurthulu in West Godavari, Andhra Pradesh for cultivation are being distributed to people for general cultivation or for research purpose. These Qunioa seeds are being sent to the recipients under Open Source Seeds MTA (material transfer agreement) incorporating the text adopted from The OSSI Pledge. 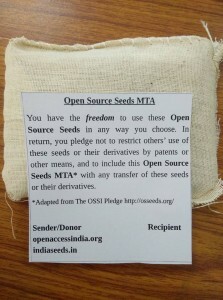 The MTA says “You have the freedom to use these Open Source Seeds in anyway you choose, In return, you pledge not to restrict other’s use of these seeds or their derivatives by patents or other means, and to include this Open Source Seeds MTA with any transfer of these seeds or their derivatives. If anyone are interested to join the OSSI or share their seeds through The OSSI Pledge in India, they may contact Open Access India, IndiaSeeds.in or the OSSI collaborator in India, the Centre for Sustainable Agriculture.